The Main Manager Calendar WEEKLY Schedule View controls the look of the employee “Everyone’s Schedule” View. 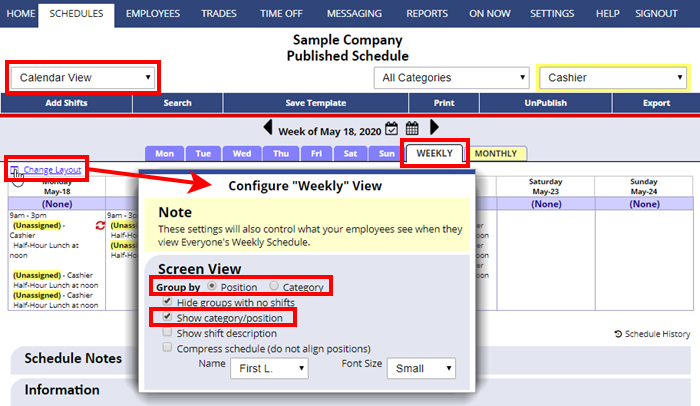 Use the ‘Change Layout‘ link on your Calendar Weekly view to set how you want the employees to see the schedule. Check off the option to “Show Category/Positions” and then choose whether you prefer to have the shifts displayed in groups sorted by Position or Category (you might want to try both to see which you prefer). The view the Main Manager creates using the “Change Layout” links set up how employees see that view in their accounts.